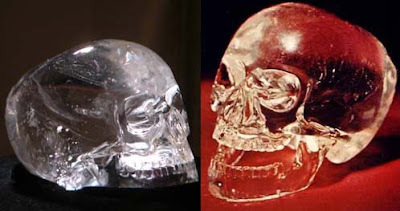 Interlocutor: I’d like to continue with the topic related to the Crystal skulls which main characteristic is the way they have been carved, because there are no machines, artifacts or skillful engineers in our planet capable to make something so perfect on crystal. The most renown and mysterious skull is the one of Mitchell Hedges that has characteristics very similar to a real human skull, with teeth and a moving jaw. The researchers emphasize that the Mayans didn't possess technical skills to make such task. I don't doubt for a moment that these skulls are made with extraterrestrial technology. Ruanel: Certainly they are. If the anthropologists looked carefully to these skulls they found, they would see that many of them are not human (homo sapiens sapiens) but rather they are of homo Neanderthal and homo pithecanthropus, that is to say, previous races to the human race. In all times, different extraterrestrial civilizations have come to study the human race. Interlocutor: Are we so privileged? Ruanel: No, not at all. It is very normal, and this is something that human beings don't understand that other races of the universe study other beings from other planets. What I don't approve are the sacrifices, that is to say the practice of vivisection or any other type of experiments to study an inhabitant of a certain race whether it drives to its death or not, because it is always an enslavement of free will. It is also necessary to highlight that there are extraterrestrial races that don't know to the human being so they don't know if they are experimenting with a being that has an intelligent decoder. Interlocutor: That is to say that they believe they are experimenting with animals? Interlocutor: And what connections have these facts with these famous Crystal Skulls? Ruanel: I have already said that for thousands of years, extraterrestrials have come to study the human race and they have made skulls that are replicas of the human skulls they were investigating. They gave these skulls to the natives in order to revert the natural fear they felt toward those "strangers" and to the experiments they made. Ruanel: These skulls were shown to Neanderthals so that they could play with them and see that there was nothing to fear. Interlocutor: I continue without understanding. Weren’t These skulls replicas of the skulls of the aliens, the Neanderthal or pithecanthropus? Ruanel: Not all the skulls were replicas of the Neanderthal or the pithecanthropus, since some of them were also from the same aliens. Interlocutor: Let’s see if I understand: The skulls were replicas of humans and aliens, and they were used by the researchers as study objects, like the students of medicine do with the skeletons of plastic, on one hand, and on the other hand like objects familiar to the natives so that they could be studied without fear. Is it correct? Ruanel: Why do you want to look for the mystery where there is none? Interlocutor: Is it something similar the dentists do with the kids when they need a dental job, when he gives them some false teeth so that they play with it and in this way avoid any fear they have? Or perhaps like the white explorers made to ingratiate with the Indians giving them objects like mirrors and those things? Interlocutor: I can’t believe that something so simple originated stories full of enigmas with these skulls! Ruanel: It is something characteristic of human beings to complicate things. Interlocutor: To these skulls they have been attributed many things, from miraculous cures to paranormal phenomena. I read the next thing: "Frank Dorland, an art restorer that made several experiments with the skull found by Mitchell Hedges, said that once a halo surrounded him by several minutes, he listened sharp sounds, similar to tinkling and that other times inside the skull and images of mountains, lights and other objects appeared, as well as a characteristic scent coming from its interior." Interlocutor: Now I understand perfectly. What a pity, I expected something more spectacular! This entry was posted at Tuesday, August 25, 2009 and is filed under Mysteries and Enigmas . You can follow any responses to this entry through the .